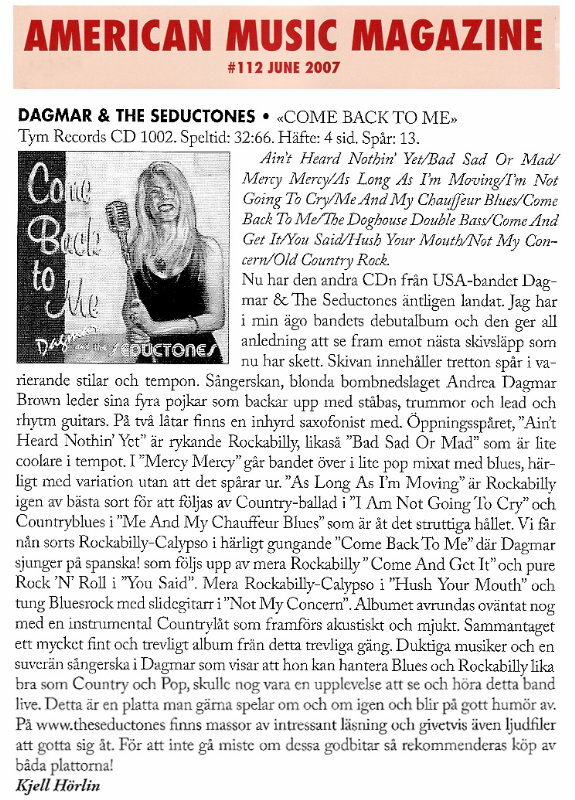 Now the second album from the USA-based band, Dagmar and The Seductones, has finally arrived. I have in my collection their debut album and that one made me look forward to the next record release, which is now here. The CD contains thirteen tracks of various styles and tempos. The female singer, the blonde bombshell Andrea Dagmar Brown, is in charge of her four guys who back her up with stand-up bass, drums, lead and rhythm guitar. Two songs have a guest musician on sax. The opening track, 'Ain't Heard Nothing Yet' is smoking rockabilly, as is 'Bad Sad or Mad' but in a cooler tempo. In 'Mercy Mercy' we get some pop mixed with blues, great variation in sound without losing the thread. 'As Long As I'm Moving' is rockabilly at its best followed by a country ballad, 'I'm Not Going To Cry' and uptempo country-blues in 'Me And My Chauffeur Blues'. I prefer to call 'Come back To Me' rockabilly-calypso style, a great swinging song where Dagmar sings in Spanish! More pure rockabilly follows in 'Come and Get It' which is more strutting; and then rock 'n' roll in 'You Said'. We get more rockabilly-calypso in 'Hush Your Mouth' followed by a great heavy blues-rock tune with slide guitar, 'Not My Concern'. The last track on this great album is an instrumental, country-flavored song, very unexpected and very nice! This is a fine album from a great band. The musicians are doing an excellent job backing the high-class singer Dagmar who shows she can handle both blues and rockabilly as well as country and pop. I am sure this outstanding band is an experience to see and hear live. It's a record you want to hear over and over again. On their home page, www.theseductones.com, there are sound clips to enjoy and lots of interesting reading.